Step Right Up Step Right Up! Come Closer, You Won’t Believe Your Eyes! Come see a show like no other! The Blue Mushroom Sirkus Psyshow will intrigue you, mystify you and leave you enchanted. BonBon Bombay joins the troupe of Speakeasy Burlesque in “Les Derniers Péchés” for a titilating evening of sin,sin,sin. September 23rd, 2013 at L’Abreuvoir’s Rococo Lounge. The Blue Mushroom Sirkus Psyshow hits the street!! 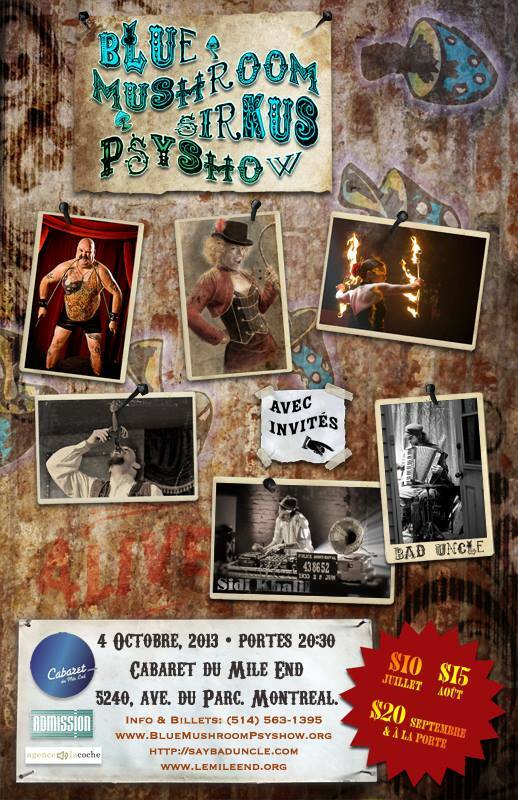 As part of OUMF Montreal, The Blue Mushroom Sirkus Psyshow with Ringmistress BonBon Bombay will be presenting little teaser shows in front of Theatre St-Denis September 6th & 7th, 2013 at 5:30,7:30, and 9:30pm. This is guaranteed to leave you wanting more!! Would you like to try your hand at burlesque performance but aren’t sure where to start? BonBon Bombay and The Lady Josephine are here to offer you the tools you’ll need to make a successful debut into the world of theatrical striptease. In this 8-week course, we will build your knowledge of the art of burlesque from the ground up. The session starts with the foundational elements of striptease and basic burlesque/neo-burlesque theory, and ends with the guided construction of a solo burlesque act for each student. Students in the class will be given the opportunity to perform their new creation in a show at the end of the session.